Amazon have announced a price reduction in their Kindle Fire HD tablet, taking the price down from £159 to £119. The £40 price drop makes the Fire similarly priced to the new Tesco Hudl tablet, lining the two retailer created tablets up for a Christmas showdown. Tesco and Amazon both follow the same business model when it comes to their consumer electronics products. They both aim to create competently spec’d devices at price points that dramatically undercut other similar products. Both Tesco and Amazon have created their tablets to act as subsidised loss leaders, largely because of their ability to sell other products for the retailers. in Amazon’s case, the Kindle opened up a whole new way of selling, and further dominating, books and other such media. 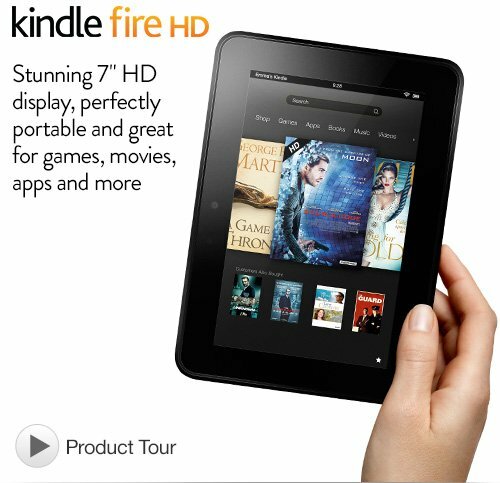 The original Kindle had a huge impact on book sales, and the introduction of the wider web-enabled Kindle Fire HD brought wider functionality which further boosted Amazon sales. Fr the first time, the Kindle could now help Amazon to peddle all of their goods. Their recent subtle logo change, emphasising the ‘A’ to ‘Z’ in ‘Amazon’, shows just how much broader Amazons focus is in 2013, compared to their book selling routes. Tesco have observed all of this and looked to follow suit. Tesco own multimedia companies like Blinkbox, as well as a slew of other consumer facing diversified products like Tesco banking and Tesco insurance. The subsidised Hudl tablet allows Tesco to sell more of these products, not to mention growing their online grocery sales. By creating a discounted tablet with native pre-installed Tesco apps for these services, the company are aiming to get the Hudl into non-traditonal tablet owners hands. The apps are deliberately simplified and intuitive, and Tesco sees the opportunity to encourage older generations to take up ownership of tablets. Tesco’s particularly aggressive price point has forced Amazon to twist. By cutting the Kindle Fire price, they are working to ensure that it remains one of the strongest value propositions on the market as we enter the critical Q4 technology selling season. It seems that the Kindle Fire HD Verses the Tesco Hudl is going to be one of the more surprising sub-plots to the christmas season. Its one that we will definitely keep our eye on.